London: Printed [for Edmund Curll], 1714, 1714. First edition. NCBEL II, 987; Straus, The Unspeakable Curll, page 227; ESTC T65369. Fine copy.. 8vo, recent brown calf period style by Philip Dusel, red morocco label, gilt rules, decorations and lettering. Frontis. Additional leaf with a printed key to the characters from Curll's later editions bound in at the end. The fictionalized memoirs of novelist, playwright and journalist Delarivier Manley (c.1670-1724). The story, written under the guise of a translation and in part a roman à clef about contemporary characters, scandals and affairs, is told in a conversation between two gentleman who discuss the life of Rivella, though she is not present. This mask of translation was a means for Manley to sing the praises of her own charms and to defend her reputation, which had come under attack because, as the narrator notes, "what is not a Crime in Men is scandalous and unpardonable in Woman, as she herself has very well observ'd in divers Places, throughout her own Writings." 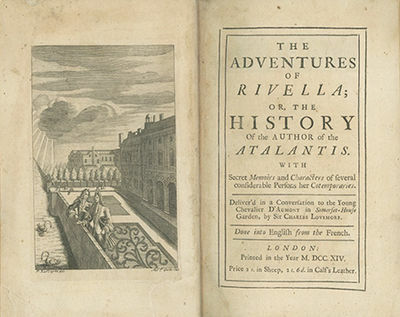 Rivella went through several editions, but Manley's name was not attached to it until after her death, at which time the publisher Curll also printed a key to the characters.